Irish national Kevin James Mallon was described as a director at British firm THG. BRAZILIAN POLICE SAID they arrested an Irishman for allegedly scalping Olympics tickets at exorbitant prices, as well as ten Brazilians who were reselling tickets purchased through credit card fraud. Irish national Kevin James Mallon was described as a director at British firm THG, which already faced similar accusations during the 2014 World Cup. THG was offering tickets for the opening ceremony for €7,200, for example, when the highest official ticket price was €1,000, inspector Ricardo Barbosa told a press conference. The tickets on offer included sought-after events such as the football finals. “These tickets can have enormous value. With this income the company could have made 10 million reals,” or €3 million, said Barbosa. Some of the tickets were believed to have been issued to the Olympic Council of Ireland. The OCI tonight said they are investigating how they ended up at the centre of a probe. The Olympic Council of Ireland (OCI) has no knowledge of the two individuals arrested. The OCI has launched an immediate investigation with our ATR, Pro10, into how the individuals were allegedly in possession of OCI allocated tickets. The OCI strictly adheres to the IOC regulations around ticket allocation, sale and re-sale. We are treating this matter with the utmost seriousness. THG was the official ticketing agent for the London Olympics in 2012. But it was not authorised to sell tickets for the Rio Games. It is THG’s second brush with the law in Brazil. During the 2014 World Cup, its manager, James Sinton, was arrested at a Rio hotel on charges of illegally reselling tickets through VIP packages. The Briton paid a fine and promptly left the country. 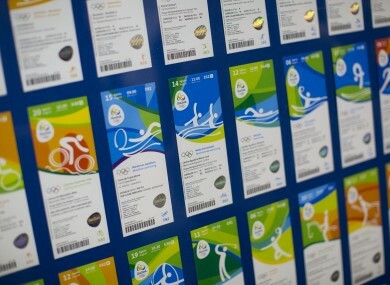 In a second sweep, police said they also arrested 10 Brazilians who had cloned credit cards to buy tickets through the Rio 2016 website, then resold them at a steep discount. Most were arrested just before the opening ceremony outside the Maracana stadium, commissioner Hilton Alonso told reporters. Another 40 illegal ticket sellers were arrested yesterday outside the Olympic Park, an organising committee official told news site GloboEsporte. Email “Irishman arrested in connection with touting at Olympics was selling tickets for €7,200 say police”. Feedback on “Irishman arrested in connection with touting at Olympics was selling tickets for €7,200 say police”.